The women, fresh off a meltdown at Tribal Council, held a team meeting and elected Sabrina as their leader. Somehow, they managed to fight over not WHO would get food, but HOW they would get food. Amazing. And the food gatherers then went swimming. Tree Mail delivered a do-it-yourself reward challenge that involved un-knotting ropes to win a tarp. No Jeff. The men won. The men set to work to build a shelter with their tarp - except Colton, who rolled his eyes a lot. And then he went to the girls' camp and helped them build a shelter there. And somehow he managed to annoy the girls as well. Sabrina compared him to a "virus." Oooh. Harsh. Colton declared to the girls that he didn't care about the game or the strategy or ... I dunno, he started crying and my BlackBerry went off, so it was a good reason to not pay attention for a while. It ended with Colton pouting his way back to the guys' camp. 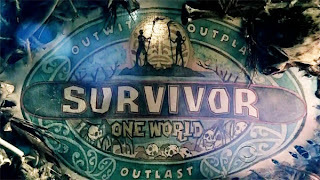 Colto told Troyzan and Jonas that he has the immunity idol and cobbled together the Misfit Alliance, declaring this was "Survivor - Colton's World". The immunity challenge involved transferring tribe members down a narrow plank with all the other tribe members standing on it. Jeff saying, "The women are completely falling apart" is pretty much all you need to know about the challenge. The men won. The talk at the women's camp was between voting out Kat, who blew the challenge (worse, I suppose, than the rest of them) and Nina, who is ... not 20. Well, no wonder she's being targetted! At Tribal Council, Jeff talked about the "absolute and total disfunction" of the women's tribe - "talking to sixth graders" and said it was one of the worst starts he'd ever seen. Somewhat shockingly, the tribe spared Kat and got rid of Nina. Next week: It rains. So, of course, this means disaster for the women.